Well folks, this leg of Transworld Tour is nearing completion. I made it to within a few hours of Bangkok this afternoon, following a nice ride with the ever-capable folks from the BMW Motorrad–South Thailand. We rendezvoused about an hour north of Ao Nang and rode into Surat Thani where they were meeting the rest of their crew for a Sunday Funday tour. Goran, Wittaya, Sarayut and company are the motorcycle authority in this region, organizing several international rides every year under the sanction of BMW international. Great dudes, excellent riders. They effortlessly carved ahead of my KLR650 on their 1200GS’s and 1600 sport tourers, but were kind enough to wait up along the way. We parted ways in Surat Thani, and I pushed north to Chumphon–gateway to the eastern diving island of Koh Tao, and hot route to Bangkok. In the name of self preservation, I plan on taking a sleeper train (with the bike, of course) into the heart of Bangkok in order to avoid some of the worst traffic on planet earth–not to mention the trickiest toll roads in all of SE Asia. 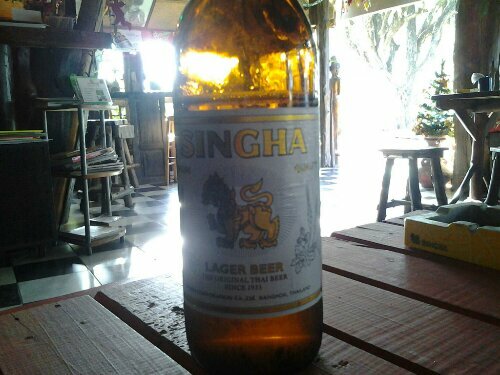 Relaxing on a cold Singha beer at The Independent Bar at the moment–across from the train station–waiting for permission to bring my bike on board. Plans from Bangkok are imprecise, but the desired end location for SE Asia is just a stone’s throw away. More from Bangkok (provided they allow my bike on the train). Posted in Transworld TourTagged bangkok, bmw motorrad south thailand, chumphon, surat thaniBookmark the permalink.